Build Your Authentic Intuitive Practice! Are you a practitioner of the intuitive/oracular arts? Do you want to reach your authentic clientele and build a successful practice? A simple and effective four-month programme you can do at home! Enjoy four months of inspiration and support for your valuable work through monthly teleseminars, recordings of the calls to use at your convenience, one private email with me per month, and a secret Facebook group for enriching discussions with your peers. Each month, you’ll gain tools and processes to help you create and maintain an intuitive/oracular practice you’ll be proud of. I’ll guide you, using my 35 years of living and working with the tarot plus my experience with circle-based group processes. What helpful elements make up this programme each month? * AUGUST: Your personal tarot Life Cards, their most evolved qualities, and a handy activity sheet to apply your life purpose energies to your intuitive practice. * SEPTEMBER: A Mapping Through the Suits process to discern where your practice is, where you’d like it to be, and steps to take to attain your goals in every aspect of your work. * OCTOBER: A personal 20-minute reading with me by phone or Skype to clarify what you’ve been exploring in the previous months, deepening the experience and pointing you in a useful direction. * NOVEMBER: A simple and clear method of synthesising what you’ve discovered and mapped out. We’ll pull the loose ends together so you’ll know what your intuitive business is about, how it benefits your authentic clientele, which marketing images and words will be most magnetic, and resources that will help your work to thrive. Registration begins Wednesday, July 23 and closes Monday, August 11. Be sure to scoop up your spot by signing up now. Remember to send me your date of birth when you register so I can calculate your Life Cards. The journey of building your practice will begin when you receive your Life Card(s) information on August 14 and we have our first group call on August 19. It will be an honour to work with you! *** This four-month programme is great for people who offer various forms of guidance: astrological counselling, intuitive coaching, tarot consulting, oracle reading, hand analysis, numerology, tasseomancy, and more! could ever do it due honour. is the thunderous voice that sang the cosmos into being. Image: Ace of Wands from the Thoth Tarot (Aleister Crowley & Frieda Harris). The Ninth of July. One month after my birthday. It’s been one month already, one twelfth of a year already. Zoom! Time is walking swiftly. It brings to mind Mary Oliver’s question, “Tell me, what is it you plan to do with your one wild and precious life?” as well as a phrase by Annie Dillard: “How we spend our days is, of course, how we spend our lives.” Is it enough to be a unique cell in the body of creation? Who can I be and what can I create that will be a valuable donation to the world and to myself? O Infinite Will to Good, let me be the most me possible while I can. Blessed be. Then I chuckled as I turned over the 3 of Wands from the Motherpeace Tarot. The picture plus Karen Vogel’s text and the number and suit system I use suggested: Defining new roles I want to play and making plans for presenting that self in ways that leave a lasting mark/impression through creative expression; a spontaneous outpouring and dynamic exchange of creative energy through communication, teaching, and learning that helps me figure out who I most want to be in the world. Not only did the card mirror my reflections, it suggested possible solutions. Today, I will express myself creatively through drawing and writing, I will share what I know in respectful communications, and I will learn what I can from my exchanges with others. By doing so, I will be at least one step closer to knowing what I plan to do with my one wild and precious life. If you’re an an intuitive guide, astrological counsellor, hand analyst, tarot consultant, oracle reader, numerologist, stone caster, or other helper who uses symbolic insight modalities, this session is for YOU. GOING (or STAYING) PRO IN THE INTUITIVE ARTS, a teleseminar with James Wells. Tuesday, July 22 at 12:00 noon Eastern Time (9 a.m. Pacific / 5 p.m. British). I’ll offer you some user-friendly tips on going/staying pro and take you through a simple process of discovery so that your practice is more specific to you and those you’re called to serve. Clarify what you offer, build on your skills, set some goals, get to know your clientele, and learn how to set fees! Q&A time and sharing will also help people to learn from one another. A link to the recording of the call will be emailed to all participants (and those who can’t make it, but would like to purchase the recording) along with a bibliography and a personal one-card reading afterwards. I’m looking forward to chatting with you on the 22nd of July! ** The number to call will be emailed to you upon receipt of payment. Image: Prince/Page of Pentacles from the New Tarot by Hurley, Hurley, and Horler. Here’s a third question in the series about my work, tools, and processes. See my response to it below the pictures. I’d like to explore deck selection when reading for others. Is it the reader’s or the querent’s privilege to select? And how powerful is the deck itself in a reading? Thank you for your question, MM! 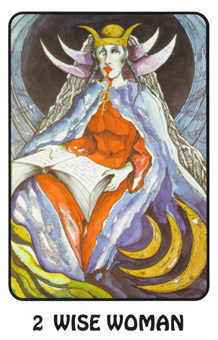 In my own tarot consulting practice, I prefer to invite the querent to choose the deck that we’ll use for hir session. There are three principle reasons for doing so. First, I want the client to be comfortable with the images and symbols that we’ll be using to explore hir topic, so s/he gets to select a pack that appeals to hir according to hir aesthetic or philosophical tastes. Second, I want to let hir know that we’ll be in a dialogue rather than me just “reading at” hir. Asking the person to pick a deck gets that rolling as s/he looks at the pictures and I say each deck’s name and mention who created it. Third, the consultations I offer emphasise choice-centredness, taking responsibility for creating one’s life through one’s choices. Laying out a few sets of cards and asking someone to choose sets a precedent that the reading will be about making conscious decisions. If the session is in person, I lay three or four decks on the table for the readee to look at — something traditional, something “far out”, and something in between those extremes. If the consultation takes place by phone or Skype, I ask the client if s/he has a tarot deck there. If so, we use hir deck and I match up the cards with the same deck on my end. If s/he doesn’t have a tarot pack on hir end, I simply choose whatever is close by here and we use that. With regard to your question about how powerful the deck itself is in a reading, I’d say that it matters. I work very interactively and conversationally. Sometimes I talk about a card and sometimes I invite the querent to talk about the image, guiding hir in an exploratory process. If the client doesn’t like the deck or feels uncomfortable with the images, s/he will be less likely to engage. If s/he likes the pictures or feels some kinship with the worldview behind them, s/he is more likely to dig in. The more s/he digs in, the more likely it is s/he will have an experience that leads to richer insights. 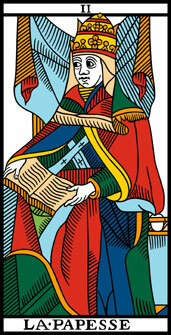 Other tarot practitioners may have different views on this. Some only work with one deck, so that’s what’s employed in every reading. 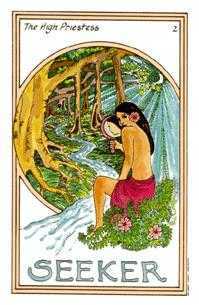 Other readers pick the deck themselves according to their mood or what they feel will fit the readee’s topic of exploration. I hope that helps, MM! 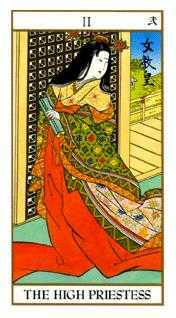 Images: Four versions of Trump 2, the High Priestess — from the Ukiyoe Tarot, the Medicine Woman Tarot, the Karma Tarot, and the Camoin-Jodorowsky Tarot de Marseille. One way to honour the concepts of one’s card(s) after a reading is to create a shrine or altar to those concepts for personal contemplation and to encourage constructive personal change. Here is one I made yesterday in a park using my card of the day, Remembrance from the Oracle of Initiation. The park bench reminds me of childhood joys of listening to the breeze in the trees in our backyard and in parks of times past. The hollow nutshell from last year, the leaves blown down a few days prior, and freshly blown down leaves show various stages of the past that led to the present moment. It makes me mindful that I am the sum of all that has gone before and that who I am now is the ancestor of my future self/selves. How can I create that future self more consciously based on who I am now? The dark and light sticks remind me of the dark and light pillars of the tarot’s High Priestess, my soul card (based on the numbers of my birth date). The card itself, in all its luminous beauty, is held in the middle. Creating this simple piece felt like an homage to my earlier self and to my beloved ancestors. Bits and pieces of Shakespeare’s Sonnet #30 came to mind so I recited what I could remember as a sort of prayer. What do you most want to honour, invoke, or evoke? What image(s) best represent it? How might you enshrine that image(s) to give it a sacred holding space? Please feel free to share it with me/us here in the Comments.